To order NAMET IT personalised Sew On Labels - Polyester online now and get free shipping just fill in the details below and click add to cart. Sew On Labels - 100% Polyester - simply lay the label flat and machine sew all around. Will not fray on any side. For hand sewing, see our sew on satin.This polyester label washes well. Printed with YOUR NAME or wording. Size is 50mm x 17mm. Your Name is centred - but ask us in the comment section to set to one side if machine sewing as a tag. 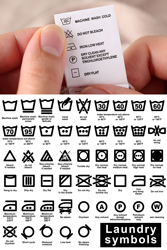 For an alternative to any sewing see our Iron On Clothing labels. A unique product. Fully guaranteed for use in Rest Homes and Boarding Schools. Ease of use and durability through the wash as our unique iron on can also be hand stitched AFTER ironing into place. This unique iron-on cannot be bought in shops. The second line is for a phone number or any other information needed. If not required, leave blank and we'll centre your text. Please feel free to write in the comment box for any special requests as we are happy to help with all your labelling needs. 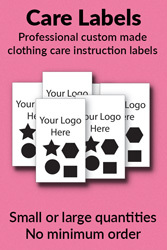 Our standard Sew On - Polyester labels above are also suitable for Care Labels. They work well for customers on a budget or if you are wanting to print something basic. OR ask us for three lines of text - by writing to us in the comment box. The more information you give, the easier to make something for you. The labels were exactly as advertised. The service was friendly, when the delivery through the post was slow, the staff were genuinely concerned and offered solutions. Just as I wanted and expected! Great consistency across the 500 labels, easy to sew into the garments. Name it labels matched the font perfectly to one I requested from Word. Quick turn around and postage. I always purchase my labels from this company. They are always of excellent quality and the service is always great. In respect of my last purchase I was late in ordering them but, they rushed the order through which I really appreciated. We were able to send our nephew back to Boarding School, confident another 100 items of clothing and camping equipment is less likely to be getting lost. The price was right, the tags were exactly what i was looking for. Sewed labels by hand not machine, found them so tough to pierce through. I was expecting material ones, however they should last being tough. My sons clothes and linen looked great and they did not wash off at boarding school. I have found the Sewn in Polyester Labels to be of good quality. They do not fray and the wording is clear and easy to read. I will be ordering more. They will be used in Products that I manufacture and send all over the world, so they had to be a quality product. I found the labels ideal for my products I sew, hats, bags and children's clothes. I ordered the labels and they arrived within a week which was great as I live in a remote area. Easy to sew onto a seam or tag. Teachers at my child's school have been especially impressed.